Donald the First of 5th Avenue let it be known that His Majesty was royally displeased that the Carrier Corporation planned to move some production facilities from Indiana to Mexico thereby eliminating 1,000 or so “American jobs”. In order to prevent the tragedy, His Majesty decided to tax the remaining serfs of his Kingdom to compensate the Carrier Corporation for saving some of those jobs. 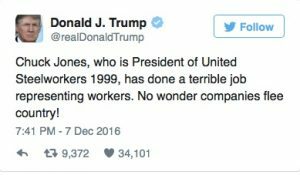 One of the Knights of the Kingdom, a Mr. Chuck Jones who is President of the Steel Workers Union, objected that his Lordship the King only saved 730 jobs, not the entire 1,000. This in turn prompted a Presidential (elect) Tweet Storm from Donald the First. Which brings us to the case of Walmart. According to the most recent data, over the last 4 quarters Walmart generated about $484 billion in revenue on which it earned $15 billion net of income taxes. Income taxes amounted to about $6.3 billion, or 29% of pre-tax profits. The firm employs 2.3 million people worldwide, of which 1.5 million are in the United States. The entire U.S. civilian labor force is 159 million. Of that total, 145 million are currently employed as non-farm workers. Which means that Walmart employs a staggering 1% of all people in America who have a job and are not working on the proverbial farm. Walmart announced Wednesday that it is going to invest $1.3 billion in Mexico in logistics, including new distribution centers. While a spokesman hastened to add that Walmart wouldn’t be moving any jobs to Mexico from the U.S., the firm did note that the investments would create about 10,000 new permanent jobs. Walmart, which already has about $4 billion invested in Mexico has singled out Mexico as a top priority for growth and is looking to double sales in Mexico by 2024. So what does King Donald the First have to say about that? Does he think Walmart needs to get a White House permission slip before making an investment? Walmart has clearly served notice that it will run its business as it sees fit without the advice and consent of an ignorant loudmouth. Good for them. Paul Ryan, please take note. In the meantime The New York Times reports that His Majesty is considering turning over operational responsibility for his business to his two adult sons, but that he also intends to keep a stake in the business. Perhaps His Majesty will seek subsidies for his own business so he can persuade himself to cease procuring products abroad that he intends to brand with the Royal name. In a story headlined “Trump Inherits Obama Boom” Ben White, Chief Economist for Politico says that the U.S. economy is the envy of the world. Well, yes it is. But it has been for a very long time and it has nothing to do with Obama. Real GDP growth during Obama’s tenure will have clocked in at 1.5% when all the numbers are finally counted. That’s about the slowest recovery on record. Keep in mind that the painfully slow recovery has also been accompanied by the first drop in U.S. life expectancy in about 20 years according to the National Center for Health Statistics. Apologists argue that the slow recovery is due to the depth of the 2008 – 2009 slump. It’s actually the other way around. Deep slumps are usually followed by rapid recoveries. And while the unemployment rate has fallen to 4.6%, much of that is due to the collapse of the labor force participation rate, now at 62.8%, the lowest is has been since 1978. It has been falling steadily since its March 2000 peak when it clocked in at 67.3%. Please see the graph below.